Draw-Tite - Featuring side-to-side pivot action to better accommodate hook-ups on uneven ground. Quick and easy installation, strong performance and easy removal in just seconds to allow full access to the truck bed. •Two-jaw locking system with locking jaw handle. The heart of the DrawTite Fifth Wheel Hitch is the Universal Rail Kit, a DrawTite innovation. It strengthens the vehicle frame and easily allows the hitch to be removed from the truck bed when not in use. Simply remove four pull pins, leaving the entire bed available for maximum cargo capacity. This rail system also allows for the flexibility to upgrade your hitch should your future towing needs change. 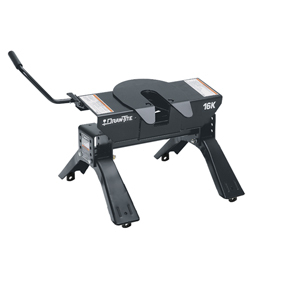 DrawTite’s patented, cast dual-jaw locking mechanism assures a positive connection to your trailer. It completely surrounds the Fifth Wheel king pin to assure safe and proper towing. On the 16k and 20k models, side-to-side as well as fore-and-aft pivot is available to make hooking up on uneven ground faster and easier. New improved one piece legs feature a wider stance for increased integrity while towing. Another DrawTite innovation designed especially for short bed trucks is the Fifth Wheel Slider. Designed for the 15K and 16K models, this innovative base travels up to 10”, making tight turns and reverse maneuvers safer and helping to avoid truck and trailer damage. Six rollers ensure easy operation each and every time.